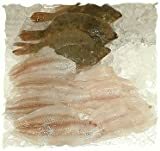 Sole are various species of flatfish, although the name is often haphazardly applied, particularly in North America, to many different types of flatfish. The Dover sole is often considered the most prized variety. Once you taste our Sole Almondine you'll be hooked! 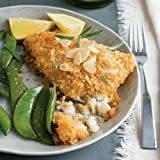 Premium boneless sole topped with tasty cheese-flavored bread crumbs and crunchy sliced almonds. Quick and easy to fix... bake, serve and dive in! INGREDIENTS: Sole, Bleached Wheat Flour, Vegetable Oil (Canola, Cottonseed, And/Or Soybean), Water, Butter (Pasteurized Cream, Salt), Contains 2% Or Less Of: Almonds, Spices, Salt, Unsalted Butter (Pasteurized Cream, Natural Flavor), Dehydrated Cheddar Cheese (Pasteurized Milk, Cheese Cultures, Salt, Enzymes, Disodium Phosphate, Annatto), Natural Flavor, Sugar, Yellow Corn Flour, Yeast, Onion Powder, Beta Carotene (Color), Caramel Color, Paprika Extract (Color), Sodium Tripolyphosphate (To Retain Moisture). Contains: Fish (Sole), Wheat, Milk, Tree Nuts (Almonds). 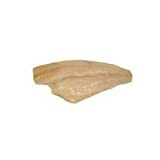 Frozen Seafood Yellow Fin Sole Fillet - 5 Ounce, 10 Pound - 1 each.